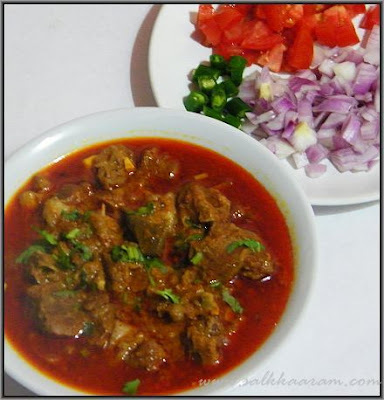 Mutton Rogan Josh / Kashmiri Mutton Curry | Simple and Delicious ! 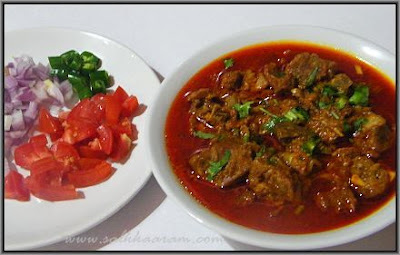 You may be confused if you are searching for a rogan josh recipe in the net. The ingredients vary in each recipe, some use onions and tomatoes, some omit it , and some add garlic and others do not.. Even within the Kashmir itself , the recipes vary according to regions and traditions. (read it here) I added little onion to satisfy my self, but omitted tomato completely. I didn't get the ingredient 'Ratanjot' that Kashmiris used in their curries. Using asafoetida in a meat curry will make Keralites think 'strange' since we don't have any experience in using it other than using in a sambar, rasam or a pickle..
Marinate with half of chilly powder , 2 Tbsp curd, 1 tsp garlic and ginger paste and salt. Heat oil, saute chopped onions until slightly brown. Add cardamom, cloves, cinnamon and saute for few seconds. Add remaining garlic and ginger paste and saute for 1 minute. Add all the powders and remaining curd along with marinated mutton pieces and cook until done. Add enough salt while cooking . That mutton curry looks spicy and inviting! I will have to try this one out, as I love a good rogan josh, but have never tried to make one myself. I wonder if i will be able to get asafoetida powder in the UK?